A computed tomography (CT) scan of the temporal bone is useful to evaluate it for extracranial complications of otitis media (OM). A magnetic resonance imaging (MRI) study is useful to evaluate for intracranial complications of otitis media (OM). An impedance measurement (tympanogram) is an indirect measurement of eustachian tube and middle ear function that suggests the presence or absence of effusion or pressure in the middle ear space. Audiometry is critical in determining any temporary effects that middle ear fluid may have on hearing sensitivities. 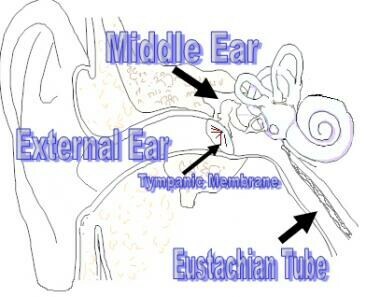 Eustachian tube dysfunction (ETD) can be treated primarily with a combination of time, autoinsufflation (eg, an Otovent), and oral and nasal steroids (budesonide, mometasone, prednisone, methylprednisolone). Nasal and oral antihistamines can be beneficial in patients with allergic rhinitis. Leukotriene antagonists (eg, montelukast sodium [Singulair]) are helpful in some patients when oral steroids are not an option. Adequate control of laryngeal pharyngeal reflux helps to resolve eustachian tube dysfunction (ETD) in patients with an associated peritubal inflammation from reflux. Proton pump inhibitors (esomeprazole magnesium [Nexium], rabeprazole [Aciphex], omeprazole [Prilosec]) administered twice a day are often used. Adenoidectomy is indicated for refractory otitis media with effusion (OME) in children older than 4 years and in younger children when adenoid pathology is present (eg, chronic adenoiditis, adenoid hypertrophy). Acute otitis media (AOM) can be described on the cellular and molecular level as a transudation of neutrophils, serum, and inflammatory mediators into the middle ear space. This transudation is associated with mucosal edema of the middle ear and bacterial or viral infection of the eustachian tube and middle ear space. Chronic otitis media (COM) involves a transudation of serum with less cellularity of the effusion material. The inflammatory mediators are less destructive, and bacteria and viral antigens may be less prevalent. See the image below. Otitis media (OM) is the most common diagnosis made by office-based physicians of children younger than 15 years. Otitis media (OM) is the most common reason children are prescribed antibiotics and the most common indication for surgery in children. Rates of otitis media (OM) equal to or higher than rates in the United States are noted internationally, especially in less developed countries. A delay is evident in the peak incidence of otitis media (OM) in European children, which may be attributable to the fact that European children enter childcare at a later age. In the era of modern medicine, middle ear infection rarely leads to mortality, except in rare cases of intracranial spread of infection. Eustachian tube dysfunction (ETD) and chronic otitis media with effusion (COME) affect 70% of children by age 7 years and are common causes of childhood hearing loss. Morbidity from otitis media (OM) primarily stems from the effect on hearing. In most cases the conductive hearing loss is entirely reversible with medical or surgical treatment. Children may have a speech/language acquisition delay from recurrent acute otitis media (AOM) or chronic otitis media with effusion (COME). Otitis media (OM) has not clearly been shown to affect the long-term acquisition of language skills in children; however, studies have predicted that early recurrent otitis media (OM) and chronic otitis media with effusion (COME) may be predictive of future decreases in hearing as measured by school screening tests and a decrease in overall school achievement. These findings suggest a possible long-term effect on the central auditory pathway. American Indian and Native Alaskan children, including the Inuit, have higher rates of chronic otitis media (COM) than whites. Hispanic children have higher rates of otitis media (OM) than either whites or African American children. The prevalence of chronic suppurative otitis media (OM) is highest in Inuits of Alaska, Canada, and Greenland; Australian Aborigines; and in American Indians. High prevalence is also found in Pacific Islanders and Africans. Low prevalence is found in residents of Korea, India, and Saudi Arabia. The lowest prevalence is found in residents of the United States, United Kingdom, Denmark, and Finland. Males have a higher prevalence of acute otitis media (AOM) and undergo myringotomies and tympanoplasties more frequently than females do.